Launched in January 2018, Nanex is the premier trading platform for Nano coin and provides crypto-crypto trading service. The Nanex website does not provide any information about the company operating the exchange, its location, nor the manner in which the clients’ assets are stored. 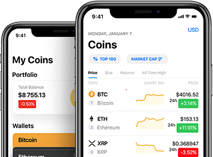 In addition, it provides an online wallet where you can keep and transact the coins supported by the exchange, and also uses one of the most effective measures against coin theft - Two-factor authentication (2FA).